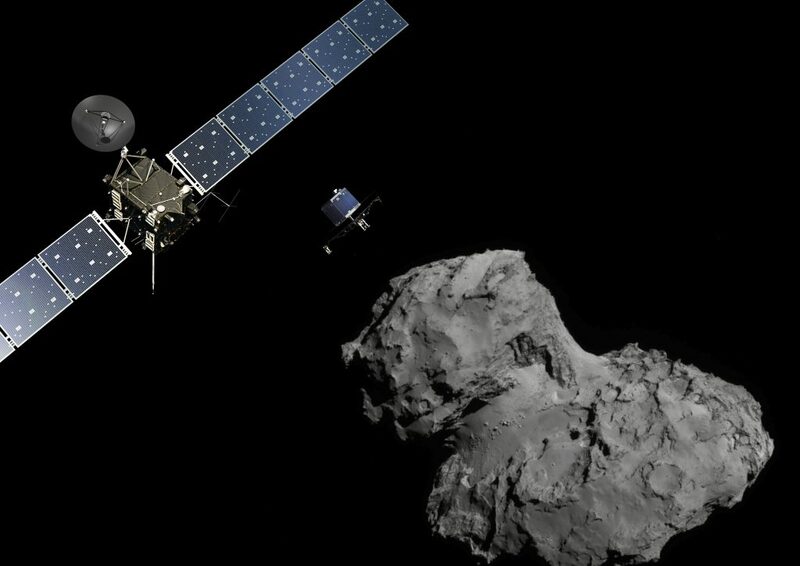 The European Space Agency (ESA) has made comet exploration one of the cornerstones of its Horizon 2000 scientific programme, and Rosetta its key mission to a comet. It takes its name from the Rosetta Stone which made it possible to decipher hieroglyphics. The Rosetta mission is an ESA exploration mission to study comet 67P/Churyumov-Gerasimenko. It is devoted to the study of the environment of cometary nuclei and their evolution in the vicinity of the Sun. Artist’s impression of Rosetta and Philae lander in the neighbourhood of the comet 67P. Credit image ESA. Rosetta made 2 world firsts: it was the first mission to successfully put a probe into orbit around a comet and place a landing module on its surface. Rosetta aimed at understanding the processes behind the Solar System formation, the formation of the Earth, the origin of terrestrial water, the appearance of life, and to study the relationships between cometary and interplanetary material. 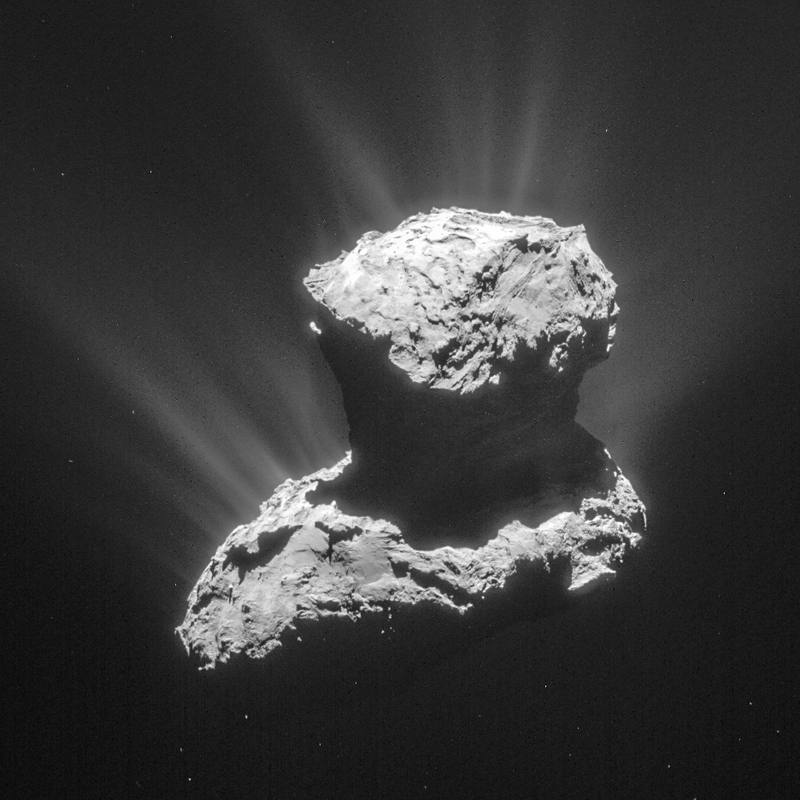 To do this, Rosetta undertook an in situ analysis of the comet nucleus, its structure and environment. A real “archaeological” study of the comet nucleus was carried out: mapping, strength, density, texture, thermal properties of its surface, global chemical, mineralogical and isotopic characterization of volatile substances and refractory materials. Rosetta observed the comet to study the physical and chemical phenomena that govern the surface of the comet nucleus and the internal coma. The evolution of the comet’s activity as a function of its distance from the sun was monitored. The Rosetta orbiter was the first spacecraft to be placed in orbit around a comet. It contained 11 instruments or instrumental consortia (ALICE, CONSERT, COSIMA, GIADA, MIDAS, MIRO, OSIRIS, ROSINA, RPC, RSI, VIRTIS). The Rosetta orbiter looks like a large 12 m3 aluminium box, equipped with 2 adjustable solar panels with a 32 m span. It uses a mobile antenna for its communications with the Earth (radio signals up to 50 minutes). The Philae lander was the first probe designed to land on a comet. It carried 9 scientific instruments (APXS, CIVA, CONSERT, COSAC, MODULUS PTOLEMY, MUPUS, ROLIS, ROMAP, SESAME) to study the comet’s surface. The launch of the Rosetta probe, initially planned for January 2003 for Comet Wirtanen, was postponed following the failure of Ariane 5 flight 157 on December 11, 2002. A new appointment was made for a launch between February 26 and March 16, 2004 towards another comet: Comet 67P/Churyumov-Gerasimenko. The programme, which costs nearly €1 billion, was supported by 17 countries, including Germany, France, Ireland and the Netherlands, in cooperation with NASA, European space agencies and international partners. Launch of Rosetta. Credit ESA-CNES-ARIANESPACE. 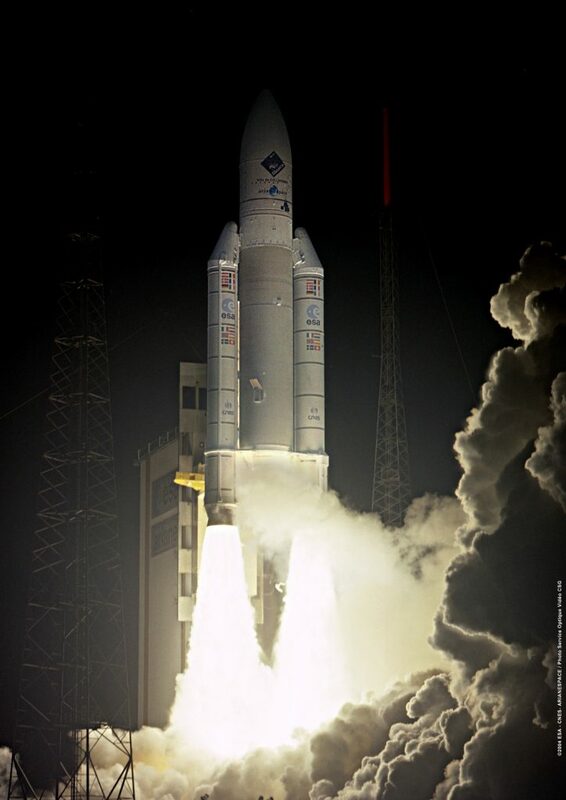 The cometary probe Rosetta was launched from Kourou (Guiana Space Centre) on 2 March 2004 by an Ariane5 G+ rocket, carrying 21 scientific instruments (10 on the landing gear and 11 on the orbiter). Almost 2h30 of thrust was required to propel ROSETTA into space: 3 tons, including 1,670 kg of fuel and 165 kg of scientific experiments. Before reaching its objective comet 67P/Churyumov-Gerasimenko, the Rosetta probe made a long journey and passed three times near Earth (3/03/2005, 15/11/2007 and 11/11/2009) and once near Mars (27/02/2007) to allow it to gain speed by gravitational assistance. She believes two asteroids, Steins (September 2008) and Lutetia (July 2010). Rosetta is then placed in hibernation in June 2011. 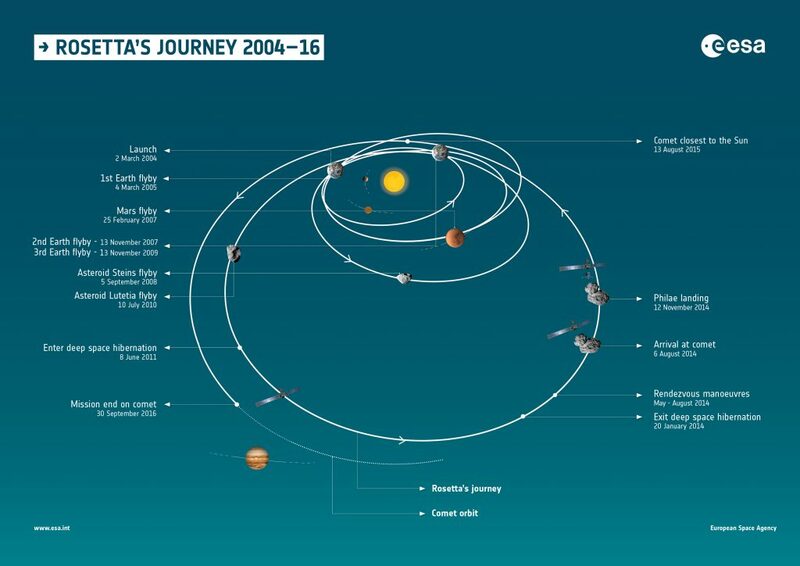 The cometary science mission began in mid-2014, after Rosetta rendez-vous with comet 67/P. The probe then accompanied the comet as it approached the Sun, constantly observing it. A landing module was dropped off in November 2014. The study of the comet and its environment extended over more than 25 months. Nominally scheduled to end at the end of December 2015, the mission has been extended for a further 7 months, until end of September 2016. The long Rosetta’s journey. Credit image ESA. 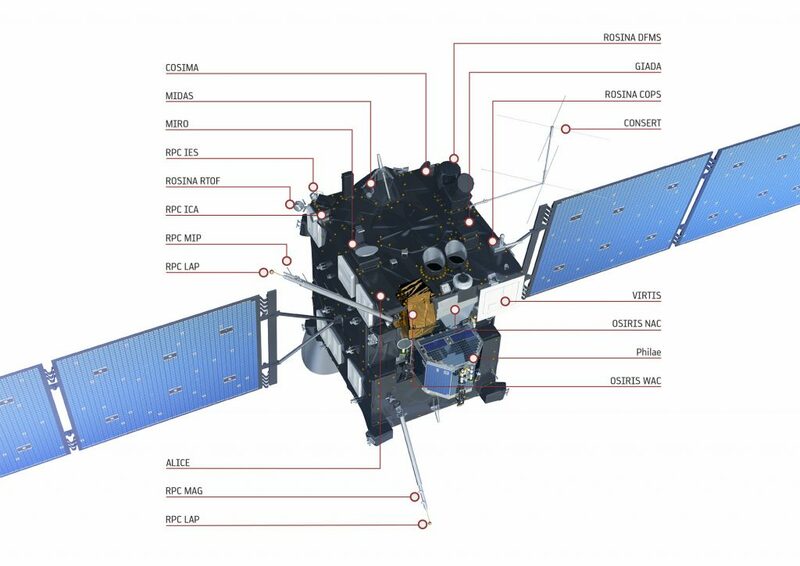 LPC2E is strongly involved in the European cometary mission Rosetta, whose adventure began more than 20 years ago. The LPC2E is the Principal Investigator (PI: Principal Investigator) of one instrument (RPC-MIP) and Co-PI of another (COSIMA) both on the orbiter. He has designed and produced various modules of these instruments and brings scientific expertise to the consortia of which they are part. He is also Co-I of the ROSINA and RPC-LAP instruments, also on board the orbiter. The RPC-MIP (Mutual Impedance Probe) and RPC-LAP (two Langmuir probes) instruments monitored the ionized environment of the comet and its interaction with the interplanetary environment with different and complementary measurement techniques. In a particular mode, they even worked together, with LAP acting as a transmitter and MIP as a receiver. These two instruments are part of the Plasma Consortium (RPC: Rosetta Plasma Consortium) which also includes a magnetometer (RPC-MAG), an electron analyzer (RPC-IES), and an ion analyzer (RPC-ICA) which has been operated in a closely coordinated manner. The COSIMA (COmetary Secondary Ion Mass Analyser) instrument is a real mini physico-chemistry laboratory that analysed in situ the composition of dust particles ejected from the comet coma 67P/CG using the time-of-flight secondary ion mass spectrometry technique (TOF-SIMS: Time Of Flight-Secondary Ion Mass Spectrometry). It is a complex instrument composed of: (i) a storage area for sample receiving targets, (ii) an articulated mechanical arm for handling the receiving targets, (iii) a camera for determining, by photography before and after each exposure to the cometary dust flux, the location of the cometary grains on the receiving targets, (iv) the TOF-SIMS mass spectrometer itself, (v) and a heat treatment zone. The COSIMA PI-ship is carried by the Max Planck Institute (which has moved from Lindau to Göttingen). The ROSINA instrument (Rosetta Orbiter Spectrometer for Ion and Neutral Analysis) actually consists of 2 mass spectrometers with different characteristics and a pressure probe. Mass spectrometers study the gaseous part of the comet. The pressure sensor provides information about the vessel’s environment. ROSINA is managed by the University of Bern in Switzerland. The comet 67P/Churyumov-Gerasimenko. Credit ESA-Rosetta-NavCam.